This is one of several Black Monster models. It's a dive watch that is both rugged and handsome. 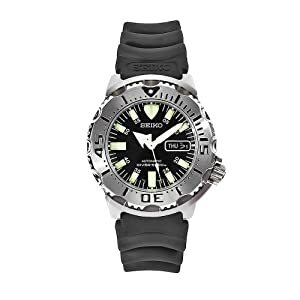 It has a bezel that only rotates in one direction - standard for dive watches - and a big screw-in crown located in the 4 position for extra comfort. The hands and markers are big and luminous, so it's easy to tell time in the dark or outside in the daytime. The bezel has big "scoops" cut out of it, which makes it easy to hold without slipping. It has a rubber strap that is comfortable to wear and very tough. The water resistance is rated 200 meters (660 feet). It's an automatic movement which means that the watch that is wound by arm movement and doesn't use batteries. This watch has earned the respect of many men over the years. It would make a great gift.